A report at the office. It can be so discouraging to wait. As a Christ-follower, we know God hears our prayers, but what goes through our minds when there doesn't seem to be an answer? Or maybe there's a hope of good things to come, but what do we do in the in-between time? In the wait? While I wait on my own circumstances, I've found myself strengthened by the hope of the future. God does promise us glorious things in His Word and I am determined to believe those. As my husband has encouraged me many times: "Keep a long-term view, Wendy." However, I find myself faltering as I wait day by day. What do I do when I am exercising faith, which is the substance of things hoped for, the evidence of things not seen, but my circumstances haven't gotten the memo? It's not a fruitless wait, however. In this wait, GOD is working. He is a good Father who is at work for my own good. While I may not know when the answers or changes will come, He assures me that He will strengthen me in the waiting room of life. Pray. And I mean really pray. Like get up early even when you don't want to and cry out your needs to God. Go for long walks and talks with God. Pray with your husband, or a girl friend, and strengthen one another as you depend on the One at work. Believe. Shut down the "what-if's" and turn off the fears. Believe that God is working all things for your good if you are His child. Believe His word and His promises. Believe that your prayers will be heard--even the crazy, big, only-God-can-do-this prayers. Read. Saturate yourself in God's word. Renew your mind with truth and scatter the lies and darkness away. For me, this means reading all throughout the day so God's truth can be fresh in my mind. Be kind. I don't know about you, but I find that God refines me in the wait. Who else gets a little testy at a red light when you're in a hurry? Or being put on hold indefinitely? Anyone yell at a child because he doesn't 'get it' right away and you might have to repeat your instructions over and over and over and over...? Those are just the little life-problems that get me frustrated; what about the big ones? You better believe it's hard to be kind in the big problems of life. As we wait on prodigals, on relationships to be restored, on medications to do their work, we have the opportunity to practice the lovingkindness of God. Real kindness, the sort that you have to practice day after day, is impossible apart from the Holy Spirit's work in you. Is it natural for you to smile and be kind to those who hurt you? No. We need Jesus! 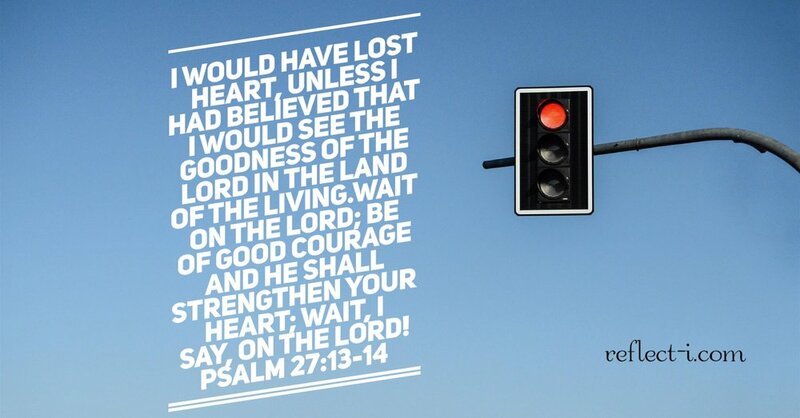 Wait on the Lord. Be courageous. And, He will strengthen you. What a promise! !